Household food insecurity refers to uncertain or limited access to enough food for all household members to lead an active and healthy life. Child food insecurity is the most severe form of food insecurity, in which food supply is so limited that parents can no longer buffer their children from scarcity. Click here to read more about Food Insecurity. What is the size of the problem in the United States? In 2011, 17.9 million US households (15 percent of the population) were food insecure. Food insecurity disproportionately affects families with young children; 20.6% of US households with children were food insecure (compared to the rate of 15% in the general population), according to the USDA’s report on Household Food Security in the United States. In 2010 report, the Feeding America/Second Harvest emergency food network reports providing annual hunger relief services to 37 million Americans—including 14 million children—an 46% increase over 2006. Click here to read Feeding America’s Hunger & Poverty Statistics. Click here to go to the United States Department of Agriculture’s Economic Research Service, where you can access national data and evaluation on food and nutrition assistance. What does science have to do with ending food insecurity? The science of our work shows how hunger affects the body, brain, and development of a child. Nutritional deprivation can cause lifelong harm in children by stunting their growth, especially during their early development in ages zero to three. Based in scientific inquiry and research, we know that children who experience food insecurity at a very young age are more likely to have increased hospitalizations, health problems, impaired development, behavioral and emotional problems, and to have trouble in school and in the workforce. The pictures at left, from the Center on the Developing Child at Harvard University, show developing neuron connections in the brain and illustrate the devastating impact of hunger and its associated stresses on brain development in very young children versus a normal child. For more information about the science as it relates to ending hunger, read Children’s HealthWatch research findings or publications. Why is nutrition relevant to child health and development? Poor nutrition increases young children’s risk of contracting illnesses and compromises their immune systems, creating a downward cycle in which children lose weight with each illness. Because the family often has no extra food (or money to buy it) to build them back up again, children are left malnourished and more susceptible to the next illness, which is often more serious and leads to more depletion, so that children end up in hospital suffering from the infection-malnutrition cycle. 30% more likely to have had a past hospitalization. 90% more likely to be in fair or poor health. Nearly twice as likely to have iron-deficiency anemia. 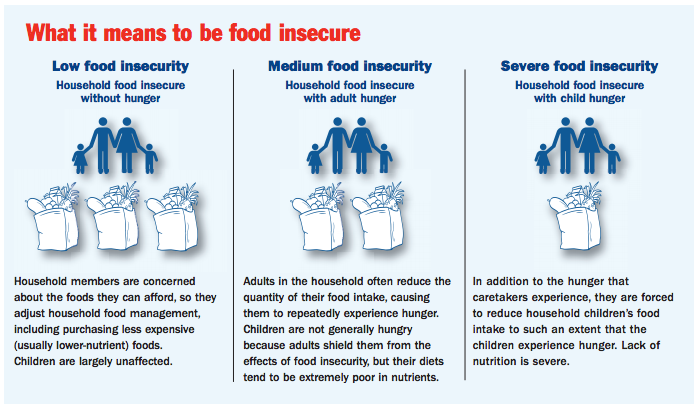 What are the development consequences of food insecurity for children? Developmental gaps between food insecure infants and toddlers and their food secure peers are present long before starting kindergarten. Infants and toddlers from low-income families are put at increased risk for cognitive, motor or behavioral problems by food insecurity. Developmental risk in early childhood is defined by a continuum of vulnerabilities: slow development in one or more areas—such as speaking, moving, and/or behavior and identifies children with an increased likelihood of later problems with learning, attention, and/or social interactions. Developmental risk can be “invisible.” Even when children’s growth has not yet been affected, food insecurity can negatively impact infants’ and toddlers’ development. Underweight infants and toddlers are 166% more likely to be at developmental risk as compared to normal weight infants and toddlers. Infants and toddlers in low-income, food-insecure households are 76% more likely to be at developmental risk. What does food insecurity among children have to do with public policy? The first three years of life are a critical period for good nutrition, which establish the scaffolding for children’s future health, academic achievement and subsequent workforce participation. Of all the many factors jeopardizing children’s health, development and school readiness, food insecurity is the most easily remedied. Nutrition assistance programs, like CACFP, WIC and SNAP/Food Stamp Program, are effective and efficient ways to decrease food insecurity. were behind on rent at any point in the last 12 months. These situations, while less severe than traditional measurements of homelessness, are both more widespread and harder to identify. Homeless children are recognized as being vulnerable to multiple health risks, but there are millions of less visible children whose health, development and growth may be compromised by living in insecure housing. Click here to read Children’s HealthWatch’s research findings on housing. What are the health consequences of housing insecurity for children? Read our publications on the health effects of housing and housing insecurity. Energy insecurity occurs when there is limited or uncertain access to enough home energy to sustain a healthy and safe life in the geographic area where a household is located. Moderately energy insecure families have received a letter threatening utility shut-off in the last year. Severely energy insecure families have experienced an actual utility shut-off, at least one day with no energy for heating or cooling, or have used a cooking stove as a heating source in the last year. Click here to read our research findings on the impact of household energy affordability on health.